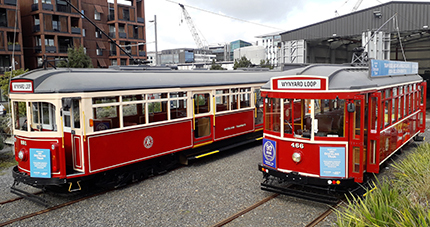 Keeping New Zealand transport history alive, the 1.5km purpose-built Auckland Dockline Tram circuit represents a return of trams to the City of Sails for the first time in 55 years. 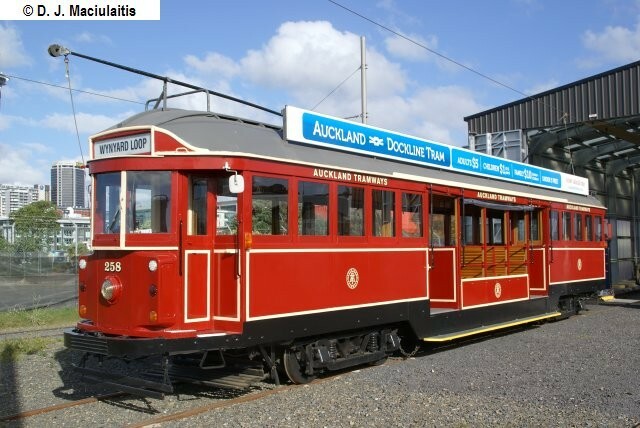 The original Auckland tramway system opened on November 17, 1902. It was not New Zealand’s first tramway. That honour belongs to Dunedin, but Auckland boasted New Zealand’s first city to go in for a complete tramway system – one that went everywhere. 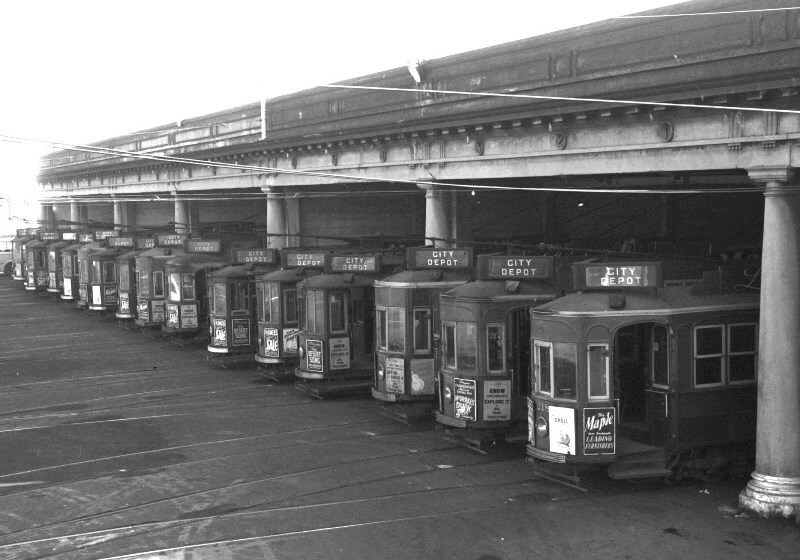 Prior to the tramway system closing down in December 1956, trams ventured to and from City Depot in Gaunt Street, one of two depots that housed the city's 256 strong fleet of trams. For the trainspotters, gunzels and foamers amongst us... or perhaps you’re just interested in knowing the details! This is an X1 class and one of 10 single truck tramcars constructed by the Melbourne and Metropolitan Tramways Board at their Preston Workshops in 1926 for use on lightly trafficked lines. Its former fleet number was No. 466. 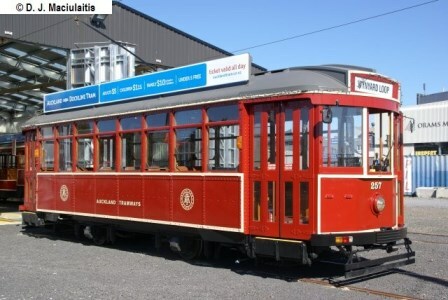 It is not unlike the famous Birney tramcars that ran in two New Zealand cities. It has two 40 hp electric motors. This car was provided by Newstead Trams in Victoria, Australia. 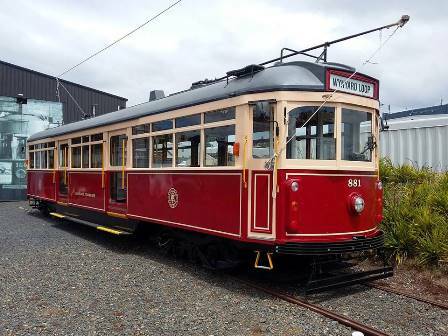 This tram started its new life here in Auckland as No.257, as at the time it was considered prudent to number the two trams after the last of the original Auckland tram fleet No.256. However with the return of No.258 to Bendigo in 2015 and the acquisition of No.881, it was then decided to retain the original fleet numbers. So after a major body rebuild here in Auckland in 2017-2018, this X1 class tram has returned to its original Melbourne fleet number of 466. Also from Bendigo, was formerly No.421 a Melbourne W2 class of 1927. It has been modified for Auckland Dockline Tram by opening the centre section and installing extra seating. This tramcar, riding on two 4-wheel bogie-trucks, is fitted with four 40hp motors. It is a type of tramcar that ran on the Melbourne and Metropolitan Tramway for 60 years. This car was provided by Bendigo Tramways, Victoria Australia. The tram was returned to Bendigo in May 2015. One of 119 SW6 class 2-bogie trams which were introduced from 1939 to 1951. Today a small number of these cars remain in service and have been modified to suit today’s traffic conditions and one-man operation with the installation of new braking systems and speedometers. The traditional trolley poles have also been replaced with pantographs. No.881 was in active service in Melbourne until December 2014 and in July 2015, Development Auckland successfully negotiated to purchase No.881 and sister SW6 No.852 from Public Transport Victoria with them being shipped to Auckland in August 2015. After major refurbishment, No.881 is now painted in the 1930’s Auckland livery of Carnation Red and Cream. There are some exciting plans ahead for sister tram No.852. NB: The Dockline Trams appear in the former Auckland Tramway livery of the 1930's - Carnation Red and Cream. Click here for information on the four stops along the Auckand Tram route. Read our frequently asked questions for more information on Auckland Dockline Tram.